PennsylvAsia: Adam Liu Holiday Concert "East Meets West Series 2"—featuring erhu, guqin, pipa, and xiao performers—December 2 in Allison Park. Adam Liu Holiday Concert "East Meets West Series 2"—featuring erhu, guqin, pipa, and xiao performers—December 2 in Allison Park. Lydia Music Center in Allison Park presents Pittsburgh Symphony Orchestra Assistant Principal Cello Adam Liu for a Holiday Concert on December 2. The event, titled "East Meets West Series 2," will also feature performers of traditional Chinese instruments erhu, guqin, pipa, and xiao. 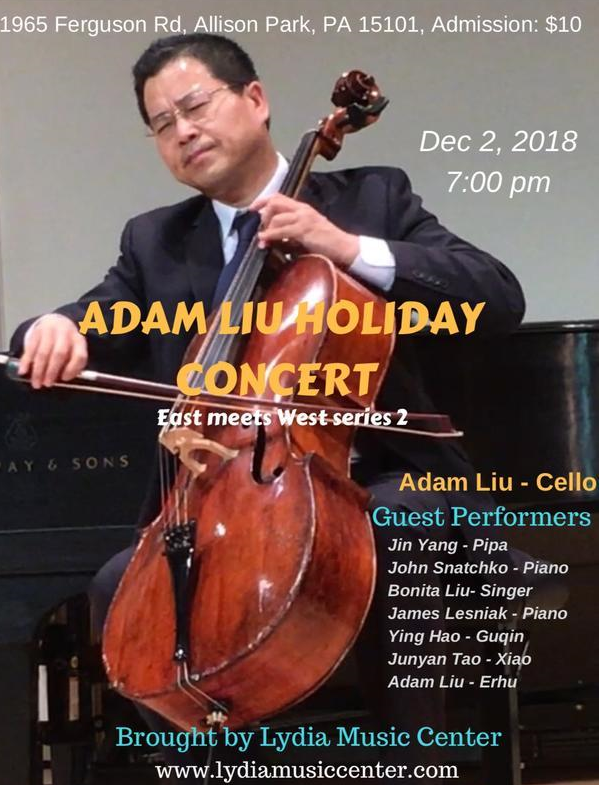 Adam Liu Holiday Concert "East Meets West Series 2" Brought by Lydia Music Center and Pittsburgh Symphony Assistant Principal Cello Adam Liu. It will be held on 12/2/2018 7:00 pm at St Paul's United Methodist Church. Featuring Adam Liu, cello, Erhu; John Snatchko, piano; Jin Yang, Pipa; Ying Hao, Guqin; Junyan Tao, Xiao; Bonita Liu, Singer, James Lesniak, piano. The concert will be held at 1965 Ferguson Road in the North Hills suburb of Allison Park (map).